The Exposition offers an excellent opportunity to learn about the latest advances in technology through an interactive approach with attendees. Participating industry will showcase its products and services among key decision makers within the DoD from the Fort Bragg area. 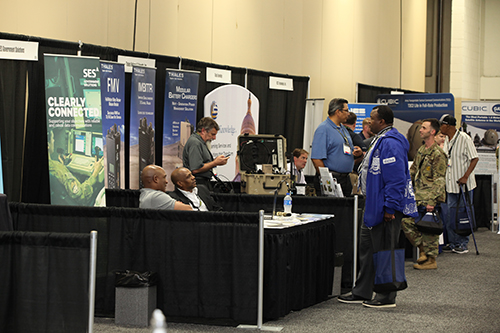 The Exposition supports the Symposium theme, "Enabling the Mission", through demonstrating new, innovative ideas and sharing best practices that promote valuable results to technology challenges faced by our military today. To download the forms and contract to register for exhibit space, sponsorships, and/or advertising, click the link below. Early teardown is not permitted and will result in a $1,000 fine to any company who disregards the posted teardown time. Exhbitor Kit is now posted! Once you are contracted to participate in the 2019 AFCEA TechNet Ft Bragg Symposium & Exposition you will be provided a link to your company portal. In your company portal you will be able to update your company overview that will be included in the printed program guide, register your staff and update other relevant information. Questions Concerning Exhibitor Kit and Booth Orders: Contact Heritage Exposition Services at (800) 360-4323 or exhibitorservices@heritageexpo.com. Company Logo: Provide a color logo in .eps format (with fonts and artwork outlined). The logo will be used in the conference program guide and event promotions (when possible). We will also accept .tiff files (300 dpi or higher) if an .eps is not available. Contact Information: Name, phone, and email address. Sponsorships: Complete sponsorship descriptions and pricing are listed on the Exhibitor Prospectus. Advertising: Increase your company's exposure by placing a display ad in the onsite event program guide that is distributed to all attendees. Please Note: If you contract for an ad but do not submit your ad artwork by the due date, your company name (or logo, if provided) and booth number will be listed in its place. Don't miss out on this great way to interact with attendees. Donate one or more raffle prizes to receive recognition in the Symposium program guide and during the raffle drawing. Companies may donate training courses, software, electronic devices, shirts, and other promotional items. Contact ctaylor@eventPower.com if you are donating an item or items so we can promote your company name/logo in the event program guide as a raffle sponsor. Everyone must register to receive the appropriate Symposium badge. Complimentary Exhibitor Badges: Each contracted company receives two FREE exhibit personnel/staff badges. The exhibitor badge covers food/beverages served INSIDE the exhibit area except for cash bars during receptions. Food/beverage quantities are limited based on the number of attendees/exhibitors and once consumed are not re-ordered until the next scheduled event. Closer to the Symposium you will receive a link to register your exhibitor personnel. Complimentary Exhibitor Badges must pre-register online and cannot be used onsite. This fee covers food/beverages served INSIDE the exhibit area except for cash bars during receptions. Food/beverage quantities are limited based on the number of attendees/exhibitors and once consumed are not re-ordered until the next scheduled event. How to Register as an Exhibitor: Booth personnel registration is not available on the Symposium website. eventPower must receive an exhibit space contract from a company before exhibit booth personnel can register. After receiving an exhibit space contract, eventPower will send the point of contact who signed the contract an email that contains a booth personnel registration link. Please contact the person in your company who signed the exhibit space contract for the link. Booth Staff Registration Payment: Credit card payments may be made through the registration link that will be emailed to you. Registration fees not collected through the website may be paid by either cash, company check or credit card when the exhibitor picks up his/her badge.